This section describes how to include videos as part of the content of your course. You can also include an About video for your course. A course About video appears on learner dashboards to market your course. For more information, see Add a Course About Video. You can create videos and add them to a course to supplement active learning components, such as discussions and problems. Videos can be effective for a number of purposes, such as presenting motivating material, showing experiments, and reducing cognitive load for complex content. For more information about how learners can interact with course videos, see Watching Videos on the edX Video Player in the EdX Learner’s Guide or Watching Videos on the edX Video Player in the Open edX Learner’s Guide. Before creating video content, decide whether video is the best medium by asking the following questions. Should the content be conveyed through text? By having learners work through a problem? Keep videos as short as possible. Learners are more likely to finish watching a video if it is no more than 5-10 minutes long. Be sure to review Create Accessible Media before you create videos for your course. To help course teams protect video assets, the edX video player hides video URLs by default. This functionality is in effect for all video files, including YouTube videos and videos that are hosted in other locations. You can allow learners to download videos by selecting the Video Download Allowed option for your video components. For more information about posting videos to hosting sites other than YouTube, see Step 3. Post the Video Online. For more information about options that you can set when you create a video component, see Setting Advanced Options under Step 4. Create a Video Component. Your videos can contain whatever content you want to include in the course. The Creating Videos section of edX101 Overview of Creating an edX Course has some helpful pointers for creating good video content. When you create videos, follow Richard E. Mayer’s 12 Principles of Multimedia Learning. The principles in this document are based on extensive experimental research of student learning. EdX recommends the following video compression specifications. These specifications are recommended but not required. Typically you export at the same frame rate that was used when you created the media file. For example, if you create the file in a country that uses the PAL system, you export at 25 fps instead of the NTSC standard of 29.97 fps. The edX video player supports videos in .mp4, .mpeg, .webm, and .ogg format. However, to help make sure all standard browsers can play your video, edX strongly recommends that you use the .mp4 format. Transcripts are required for your videos. Transcripts help learners with hearing impairments understand audio content, and they are helpful for learners who speak other languages. You can allow learners to download transcripts so that they can read them offline. You associate a transcript with a video when you create the video component. Timed transcripts in the SubRip Text (.srt) format are strongly recommended. Learners can select the Show transcript (”) icon in the video player’s control bar to show the transcript next to the video. The transcript automatically scrolls as the video plays, and learners can select a line in the transcript to jump to the point in the video where that word is spoken. Learners can also choose to show the transcript file as overlaid closed captions for the video by selecting the CC icon in the video player’s control bar. To create or obtain a transcript in .srt format, you can work with a company that provides captioning services. When you upload an .srt file, a text (.txt) file is created automatically. You can allow learners to download these transcript files. If you allow your learners to download transcripts, the video player includes an option to download the video transcript as either an .srt file or a .txt file. To prevent errors when you upload your video transcripts, edX recommends the following conventions for naming your transcript files. Each transcript file should have a unique identifying name. The name should be unique not only across the transcript files for your videos, but across all of your course uploads. File names that include special characters, such as ç, å, or ó, cause the upload option to result in an error. Before you upload a transcript, change the file name to remove the special characters. Make sure that the file type, .srt, is in lower case. Other than to separate the identifying name from the .srt file type, file names should not include periods. You can provide transcripts in formats other than the .srt format, such as .pdf, and you can provide additional transcript files in different languages. For more information about these options, see Add a Supplemental Downloadable Transcript. Historically, some courses used .sjson files for video transcripts. Use of .sjson files is no longer recommended; however, if transcripts in your course use this format, see Upload an .sjson File (Deprecated). All course videos should be posted to YouTube. By default, the edX video player accesses your YouTube videos. Because YouTube is not available in all locations, however, edX recommends that you also post copies of your videos on a third-party hosting site such as Amazon S3. When a learner views a video in your course, if YouTube is not available in that learner’s location or if the YouTube video does not play, the video on the backup site starts playing automatically. You can also allow the learners to download the video from the backup site. After you post your video online, make sure you have the URL for that copy of the video. If you post copies of your video in more than one place, make sure you have the URL for each video location. After you create your video, upload the video to YouTube. You can use any video backup site that you want. However, keep in mind that the site where you post the videos might need to handle high traffic volume. The URL for the video that you post on a third-party site must end in .mp4, .mpeg, .webm, or .ogg. (To help make sure all standard browsers can play your video, edX strongly recommends that you use .mp4 format.) EdX cannot support videos that you post on sites such as Vimeo. If you (or your beta testers or learners) encounter an error when you view a course video, it might be the result of one of these browser-related problems. Verify that the viewer’s browser is up to date. For example, some older versions of the Mozilla Firefox browser did not play .mp4 video files. These problems do not occur in more recent browser versions. For more information, see Media formats supported by the HTML audio and video elements. Verify that file metadata, particularly the MIME type, is correctly set on the host site. For example, when edX offered support for Internet Explorer 10 browsers, it was found that videos did not play if the MIME type was not set. The HTTP header Content-Type had to be set to video/mp4 for an .mp4 file. As an example of how you might set metadata on a video backup site, the Console User Guide for the Amazon Simple Storage Service provides this information about editing object metadata. To add a video and its transcript to your course, follow these steps. Under Add New Component, select Video. When the new video component appears, select Edit. The video editor opens to the Basic page. You replace the default values with your own. In the Component Display Name field, enter an identifying name for this video. This name appears as a heading above the video in the LMS, and it identifies the video for you in Insights. The default display name for new video components is “Video”. Changing the default to a unique, descriptive display name can help you and your learners identify different videos quickly and accurately. If you delete this default and do not enter an identifying name, the platform supplies “video” for you. In the Default Video URL field, enter the URL of the video. Example URLs follow. To be sure that all learners can access a video, you can create multiple versions that use different encodings or hosting services. After you post different versions on the Internet, you add each URL below the default video URL. These URLs cannot be YouTube URLs. To add a URL for another version, select Add URLs for additional versions. The first listed video that is compatible with the learner’s computer plays. Next to Default Timed Transcript, select an option. If edX already has a transcript for this video, Studio automatically finds the transcript and associates the transcript with the video. This situation can occur when you reuse a video from an existing course. If you want to modify the transcript, select Download Transcript for Editing. You can then make your changes and upload the new file by selecting Upload New Transcript. If both edX and YouTube have a transcript for your video, but the edX transcript is out of date, you receive a message asking if you want to replace the edX transcript with the YouTube transcript. To use the YouTube transcript, select Yes, replace the edX transcript with the YouTube transcript. 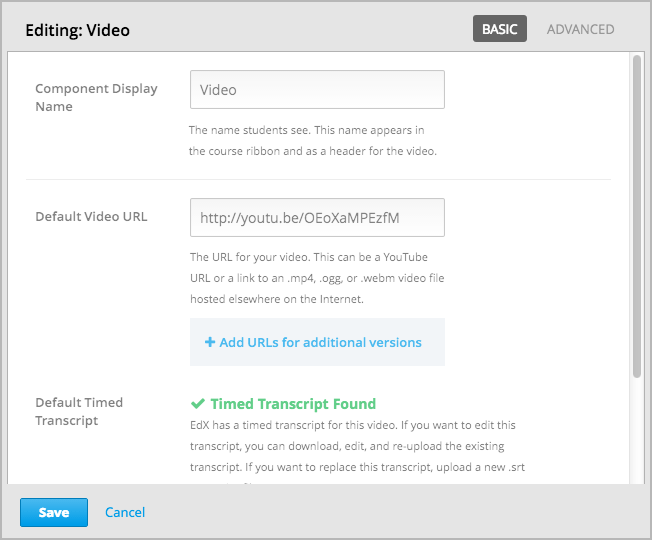 If neither edX nor YouTube has a transcript for your video, and your transcript uses the .srt format, select Upload New Transcript to upload the transcript file from your computer. If you want to provide a transcript in a format such as .pdf, do not use this field to upload the transcript. For more information, see Add a Supplemental Downloadable Transcript. If your transcript uses the .sjson format, do not use this field. For more information, see Upload an .sjson File (Deprecated). Optionally, select Advanced to set more options for the video. For a description of each option, see Setting Advanced Options. Component Display Name The name that you want your learners to see. This is the same as the Display Name field on the Basic tab. Default Timed Transcript The name of the transcript file that was specified in the Default Timed Transcript field on the Basic page. You do not have to change this setting. Specifies whether you want to allow learners to download the timed transcript. If you select True, a link to download the file appears below the video. By default, Studio creates a .txt transcript when you upload an .srt transcript. Learners can download the .srt or .txt versions of the transcript when you set Download Transcript Allowed to True. If you want to provide the transcript for download in a different format as well, such as .pdf, upload a file to Studio by using the Upload Handout field. The URL for a non-.srt version of the transcript file posted on the Files & Uploads page or on the Internet. Learners see a link to download the non-.srt transcript below the video. When you add a transcript to this field, only the transcript that you add is available for download. The .srt and .txt transcripts become unavailable. If you want to provide a downloadable transcript in a format other than .srt, edX recommends that you upload a handout for learners by using the Upload Handout field. For more information, see Add a Supplemental Downloadable Transcript. EdX Video ID An optional field used only by course teams that are working with edX to process and host video files. Select Creative Commons to grant others the right to share and use the video. You must then select the Creative Commons license options to apply. Show Transcript Specifies whether the transcript appears next to the video by default. Upload Handout Allows you to upload a handout to accompany this video. Your handout can be in any format. Learners can download the handout by selecting Download Handout under the video. For more information, see Add a Supplemental Downloadable Transcript. Video Available on Web Only If you select True, learners are only allowed to play this video in a Web browser. If you select False, learners can use any compatible application to play the video, including Web browsers and mobile apps. Video Download Allowed Specifies whether learners can download versions of this video in different formats if they cannot use the edX video player or do not have access to YouTube. If you select True, you must add at least one non-YouTube URL in the Video File URLs field. The URL or URLs where you posted non-YouTube versions of the video. Every URL should end in .mp4, .mpeg, .webm, or .ogg and cannot be a YouTube URL. Each learners will be able to view the first listed video that is compatible with the his or her computer. To allow learners to download these videos, you must set Video Download Allowed to True. Video ID An optional field used only by course teams that are working with edX to process and host video files. Learners who download and play the video in the mobile app see the entire video file. Only videos that play in a browser start playing at the specified start time. Learners who download and play the video in the mobile app see the entire video file. Only videos that play in a browser stop playing at the specified stop time. YouTube IDs If you have uploaded separate video files to YouTube for different speeds of your video (YouTube ID for .75x speed, YouTube ID for 1.25x speed, YouTube ID for 1.5x speed), enter the YouTube IDs for these videos in these fields. These settings are optional, to support video play on older browsers. After you add a video component to your course, you can provide optional collateral to accompany the video. By default, a .txt file is created when you upload an .srt file, and learners can download either the .srt or .txt transcript when you set Download Transcript Allowed to True. Options to download the transcript** appear below the video. You can provide an additional downloadable transcript in a format such as .pdf along with the default .srt and .txt transcripts. To do this, you upload the additional transcript in the video player as a handout. Learners see an option to download the handout below the video. To add another downloadable transcript, follow these steps. Create or obtain your transcript as a .pdf or in another format. In the video component, select Advanced. Locate Upload Handout, and then select Upload. In the Upload File dialog box, select Choose File. In the dialog box, select the file on your computer, and then select Open. In the Upload File dialog box, select Upload. You can provide transcripts for your video in more than one language. To do this, you work with a third-party service to obtain an .srt transcript file for each language, and then associate the .srt file with the video in Studio. Before you add a transcript file, make sure that each file has a unique name. If you use the same transcript name more than once, only the most recently added transcript will appear for every video component that is set up to use a transcript with that name. To avoid this problem, a best practice is to name additional transcript files by appending the transcript’s language to the video file name. For example, you have two videos, named video1.mp4 and video2.mp4, and their original transcripts are named video1.srt and video2.srt. When you add Spanish transcripts for these videos, you name them video1_ES.srt and video2_ES.srt. Later, when you add Russian transcripts for the videos, you name them video1_RU.srt and video2_RU.srt. To add a transcript to a video component, follow these steps. After you obtain the .srt files for additional languages, open the video component for the video. On the Advanced tab, scroll down to Transcript Languages, and then select Add. Select the language for the transcript that you want to add. Select Upload, browse to the .srt file for the transcript in that language, and then select Open. In the Upload translation dialog box, select Upload. Repeat steps 2 - 5 for any additional languages. When your learners view the video, they can select the Language menu to select a language. If your course uses .sjson files, you upload the .sjson file for the video to the Files & Uploads page, and then specify the name of the .sjson file in the video component. Only older courses that have used .sjson files in the past should use .sjson files. All new courses should use .srt files. Obtain the .sjson file from a media company such as 3Play. Change the name of the .sjson file to use the following format. For example, if the name of your video is Lecture1a, the name of your .sjson file must be subs_Lecture1a.srt.sjson. Upload the .sjson file for your video to the Files & Uploads page. Edit or create the video component. In the Default Timed Transcript field, enter the file name of your video. Do not include subs_ or .sjson . For the example in step 2, you would only enter Lecture1a. Set the other options that you want.